This listing is for one pair of Morado Opal or Mexican Purple Opal rectangular shaped drilled cabochon beads, chosen from the options listed by letter. 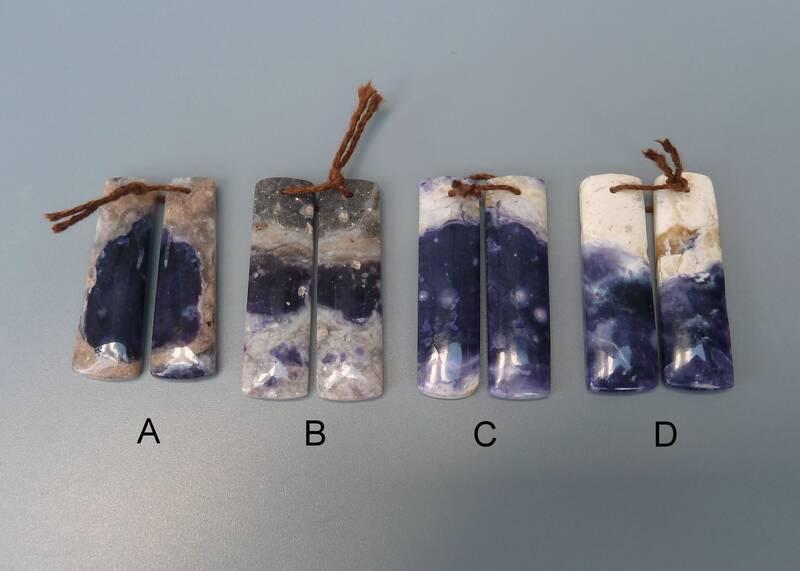 The colors in these exquisite gemstones include light and dark purple, white, and gray. The beads are drilled front to back at the top. The front side is slightly curved and the back side is flat. The back sides are pictured in the last photo. The Morado Opal which is also known as Purple Opal, Opal Royale,and Violet Flame Opal is the purple variety of opalite or common opal. It occurs in nodules and as fracture fillings and is found in central Mexico. It gets it's name from the Spanish word "morado" which means "purple." Unlike Australian Opals or Mexican Fire Opal, it does not exhibit fire or the play-of-color. It is composed mainly of silica with minor amounts of fluorite. The purple color and fluorescence of the material are attributed to the fluorite. Metaphysically, Purple Morado Opal is a stone of tranquility and spiritual connection. It encourages spiritual awareness by giving one's self clarity and strengthening intuition. Morado Opal can also help you gain prosperity by allowing you to see what your desires are and help you attain them. Beautiful and true to the pictures. Everything was packaged securely to prevent damage.